When Putnam's Shane Halladin first saw the game with the Thurston Colts on the non-conference schedule, he was excited to see what the Kingsmen could do. No, he wasn't necessarily looking for Putnam to make a statement. But if the goal was to get an accurate gauge on where things stand in the second week of December, what better measuring stick than a game against the defending Class 5A boys' basketball state champions? 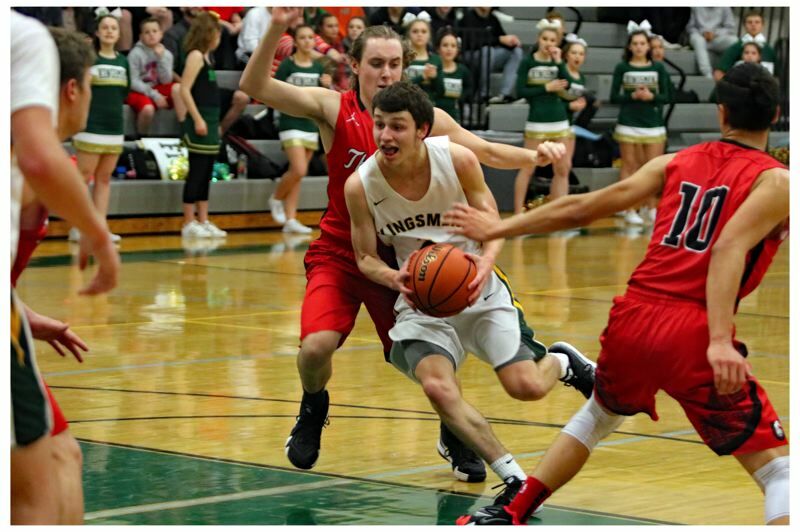 The Kingsmen stayed close for a little more than a quarter, but then went into an offensive funk just before the half and never fully recovered as Thurston's Isaac Lange and Mason Miller led the Colts of Springfield to a 70-52 win at Rex Putnam High School. "I was excited to play the defending state champs and show people what we've got," said Halladin, who led the Kingsmen with 16 points. "We were the underdog and some people expected us to get blown out by 40, but we played hard and we competed with them the whole time." After Halladin weaved his way inside and scored to lift the Kingsmen into a 20-20 tie with 6:20 to play in the second quarter, Lange and Dejean Alonzo answered with back-to-back 3-pointers for Thurston that sparked a 19-3 run to close the half, giving the Colts a 39-23 lead. In the third quarter, Putnam crept within 11 points twice -- the second time when Ruben Onishchenko hit two free throws to make it 52-41 with 1:06 remaining -- but that was as close as the Kingsmen could get in the second half. Miller scored off a pick-and-roll with Lange to close out the third quarter, and then the Colts opened the fourth on a 14-3 run that put the game out of reach. "That game was up and down," Thurston coach Blaire Liberatore said. "When we did what we wanted to do, which is not turn the ball over and try to make Putnam initiate their offense on one side of the floor instead of from the middle of the floor, we were really good. "Putnam does a heck of a job getting deflections and flying around on defense and they made it tough for us. That's a good team, in my opinion, but I'm proud of our guys for battling through. It's always tough to win on the road, so we'll take it." Lange scored 18 of his game-high 21 points in the first half for Thurston and Miller scored 11 of his 19 points in the second half as the Colts ran their record to 5-0 in their final tune-up before Friday's Midwestern League opener at Crater. Halladin was the only Putnam player to score in double figures with 16, while Onishenko added nine points, K.J. Ruffo had eight, and Grady Miller chipped in seven. "The thing that hurt us is we went through a couple stretches where we didn't score," Kingsmen coach Gregg Griffin said. "We had that stretch right before the half, and then we had another lapse when we were down 11 and they had the ball and all of a sudden, boom, we're down 20. "Thurston is a good ball club and their coaches do a good job. Offensively, they were kind of simple, but they executed well." Halladin, Putnam's senior combo guard, said most of the Kingsmen's issues came when they had the ball and struggled to find soft spots in Thurston's defense. "The constant pressure they put on you was a big factor and you just can't give in to that pressure," Halladin said. "You've got to stay strong with the ball, but we had a few slip-ups and that's what got us." The worst stretch was the last six minutes of the second quarter when the Kingsmen went 1 for 7 from the field and 1 for 2 from the free-throw line with one turnover and no offensive rebounds. "Our offense messed up," Halladin said. "We missed a couple shots in a row, they got hot and started making their shots, and they went on a little roll." Give some credit to Thurston's defense, especially Miller, the 6-foot-7 post who dominated the low post and forced the Kingsmen to alter most of their shots from inside the paint. "I thought we did a good job of keeping the ball out of the paint and not letting Putnam's guys get to the spots they wanted to get to," Liberatore said. "We made them take some tough shots, we rebounded, and when we do those two things, we can play fast, which is what we want to do." If Liberatore had to put his finger on one thing that turned Tuesday's game, he said it was "getting defensive stops." "Our theory is we're going to keep pressuring on defense and try to make things tough for you on offense," he said. "It's kind of like novocaine. Just give it time and it will work." Liberatore said he had not set out to line up a game with Putnam during the scheduling process, and Griffin said the same. It just worked out that way. Griffin said an administrator from Sandy and another from St. Helens had been in charge of scheduling games in the Northwest Oregon Conference, but that all changed when Sandy moved to the Mt. Hood Conference, the St. Helens administrator took a job as a principal in the Beaverton School District. "The job to schedule got left until people had to scramble at the end to get games," Griffin said. "For a little while, we were going to try to work with some of the Vancouver schools, but I didn't really like that because they play with a shot clock and that makes it a different game. "I don't mind playing a good team like Thurston. When it comes to RPI (power rankings), they're going to beat people, so tonight's loss will be better than a win against a team that is really struggling." When Griffin saw Thurston on his schedule, he did what any other coach would do -- he called some of his coaching buddies in the Eugene-Springfield area to pick their brains and see if any of them could send him a video of the Colts. "What they told me was Thurston had two really good players and a bunch of role players and that they play very good defense," he said. "And everything I was told was true. "Thurston was very physical and tough and tough-minded. And I guess to win a state title, you've got to be tough-minded." "I told our kids, 'We were in a fight and we didn't get knocked out,' so … a small victory," Griffin said. "We've got some long-range goals and winning tonight would have been great, but playing as well as we did in spots against a very good team was pretty encouraging." Thurston (70) -- Isaac Lange 21, Miller 19, Alonzo 14, Crist 8, Bryan 8, Casley, Muggy, Stewart, Stranieri. Putnam (52) -- Shane Halladin 16, Onishenko 9, Raffo 9, Sholty 3, Washington 2, Helgerson 1, Junta 5, Miller 7, Dyjak 1, Ferguson, Kenion, Douangphrachanh.